Most users do not pay attention to how the computer works or what particular computer terms mean, they only learn how to operate programs they need. After 2000, many things changed. Computers are largely used by people of all ages. Computers became affordable to almost everybody. They are everywhere - at work, at home. Working on computer does not mean working with one program. Internet connection becomes a must. IT (Information Technology) - a term that encompasses technologies in the field of telecommunication and computing (everything related to processing and transfer of data). IS (Information Systems) - 1. a denotation of a department within a large company that controls company's IT systems. 2. a denotation of systems intended for collecting, processing and storing of data (phone books, various databases, accounting programs. In large companies, it can be applications for customer departments or company managements.). Computer - a machine designed for processing data, based on an inserted program or specific instructions. Today's computer has gone through many changes since the first computer was introduced which resulted in its small size, higher performance, easier operation, lower price and larger range of programs. The term "computer" can either only mean the computer case itself or the entire computer set (including monitor, keyboard and mouse). Details about components and features will be published in forthcoming articles. Peripherals - An external device attached to a computer. There are two types of peripherals: input and output. Input devices are intended for controlling the computer and for data transfer into the computer. Example: keyboard, mouse, touchpad, tablet, touchscreen panel, web camera, scanner, gamepad, microphone. Output devices are intended for displaying of data from the computer. Examples: monitor, data projector, printer, speakers. Input/output devices: devices that communicate with the computer in both directions. Examples: network cards, sound cards, modems and external devices for data transfer. Computer program (program) - is a set of data instructions created by a programmer in order to tell computer what and how it should execute an operation. Features of the program determine what operations can be performed on the computer. Creating a program - A simple program can compute mathematical formulas. An advanced programmer is able to create such a program within several minutes using several lines of a programming code. A more complex program, such as games, text editors, various application for processing data of all kinds, is composed of thousands and millions of lines of the code and is created by many programmers within several months. In simple words, this terms is also defined as software or software application. Hardware - A general term covering the physical components of a computer (computer case, monitor, keyboard, mouse, printer, floppy disks, CD/DVD and other devices - accessories - that are part of the computer). This term defines all parts of computer you can physically touch. Software - denotation of computer's program equipment. Programs have various features, behavior, advantages and disadvantages. Software can be divided into two groups: application and system software. Programs cannot be physically touched, they can only be used or transferred on floppy disks or CDs. A computer without any programs would only be a pile of junk without a purpose. There is one basic program you have to have in your computer: the operating system. Operating system - Program (a set of multiple programs) which enables basic communication within the computer. Without an OS, the computer is useless. OS provides communication between software and hardware. There exist many different operating systems (more about them further in this article). Most popular operating systems are: Windows, MacOS and Linux. Documents, folders and other data - We dedicated a separate article to data storage and organization. Computer network - Connection between two or more computers through a cable or some type of wireless connection. It enables users to share information and devices between computers and other users within the network. On the network, you can share information and devices installed on other computers. You can save data for multiple computers on just one computer, share printers or CD-ROM drives. Internet - Worldwide computer network which consists of millions of computers and computer networks connected to each other. Internet is sometimes also called "network of networks" or "information highway". Its basic benefit is the access to huge amounts of information and various services that simplify electronic data exchange and provide various means of communication (text, voice, video). SuperComputers, Mainframe, large-scale computers - Computers (sometimes taking up space of several rooms) used by large companies. PC = Personal Computer - Computer intended for personal use (for just one person). After 1981, the term PC became common for computers of the IBM PC class and compatible, based on Intel processors and x86 architecture. Other computers, such as Macintosh or Alpha with its own HW and SW standards, are not widely used in the world. Workstation - A stand-alone computer or a computer connected to a network, intended for common use. In the past, Workstations denoted high-performance PCs. 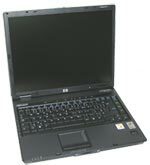 With decreasing prices, the differences between home and professional computers began to decline and so the term became common for PCs used by common users within a network. During a certain period, the classification of workstations and servers was used by Microsoft = Windows NT® Workstation / Windows NT® Server. Server - The main computer in the network that provides services. It is usually a powerful computer providing services, such as print, data storage, databases, receiving and sending e-mails, Internet connection. Larger networks can contain multiple servers. The term "server" may also denote any computer providing some sort of service. In order to provide their full and proper operation and high security, servers are usually placed in special air-conditioned server rooms. Personal PC - Desktop computer made for use on a desk, on a particular place. It can either be a workstation or a server. Portable computer (notebook / laptop) - intended for traveling. The screen size ranges from 14" to 20", weight is usually around 3 kg. Comparing to the classical PC, it is smaller but at a higher price for lower or equal performance. Its selection, HW extension and service are a bit more complicated. Pocket computers - small portable computers designed for traveling. There exist various types, such as PDA, handheld or Pocket PC. They differ in features and operating systems (Windows CE, Windows Pocket PC). Most pocket PCs have either a small keyboard or have no keyboard and are controlled by a touchscreen. They are used as small diaries with Internet access and simplified applications for office, Internet and e-mail. Palmtop / PDA (Personal Digital Assistant) – Name for pocket computers of small size, low weight and long battery life. Its disadvantage, comparing to a PC, are reduced functions (smaller memory and different screen). It is rather intended for time planning, listing addresses and notes. The OS is saved in the ROM memory, other applications and data are saved in a memory card (hard disk substitute). Together with hundreds of games and many simple office applications, a WAP internet browser appears, as well as a client for reading e-mails. The device is usually controlled by the touch-screen or using the touch-pen (Stylus). A USB cable (formerly serial) or some wireless device (infra, Bluetooth, GPRS, Wifi...) is used for communication with PC. Most popular PDAs are manufactured by Palm and Psion. Many functions of today's PDAs are similar to those in mobile phones (calendars, WAP, contacts etc.). Tablet PC is a portable computer having low weight (max 1.5 kg) and consumption. Its dimensions range between a PDA and a classical NTB (usually from 9" to 14"). It is controlled by touch screen and a special pen. Tablet PC runs on classical operating systems containing support for Tablet PCs or on systems specifically developed for Tablet PCs, e.g. Windows Tablet PC. You can take handwritten notes directly on the screen and convert them to digital text or to save them for later viewing or processing in other applications. You can also use classical keyboard or a mouse with your Tablet PC, but they can be fully replaced by the touch screen or voice control. Two basic types of Tablet PCs are: Slate providing full mobility without the need of using a mouse and keyboard, or Convertible with integrated keyboard and removable touch screen (usually with a pivot screen) = looks much like a conventional notebook. Ultra Mobile Personal Computer (UMPC) - New generation of computers called small tablet PCs. From the original Origami, the new Ultra Mobile PC was developed. First real devices were introduced by Samsung, ASUS and some others at CEBIT in March 2006. However, the development was initiated by Microsoft which had been promoting Origami at its website since February 2006. Expected UMPC features: weight less than 1 kg, 7 inch (17.8 cm) LCD touch-screen or smaller with resolution of minimum 800 x 480, touch screen control, long battery capacity, similar features to conventional PCs and NTBs, though it is not supposed to become their substitute. 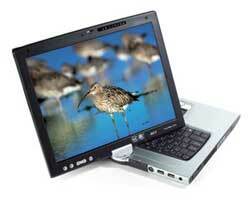 As for operating systems, Windows XP Tablet PC or Windows Vista can be used. UMPC should provide the user with many features, such as: 1. Mobile device with internet connection (Wifi). 2. Organizer. 3. Multimedia player. 4. Helpful entertainment device for traveling users. 5. GPS (in combination with a receiver and an electronic map software). 6. TV signal receiver. The planned price should be about $1000 at the beginning, later might hopefully drop to $500. Unfortunately, the first models still do not have long battery capacity. In the future, the endurance is supposed to increase from 2 hours up to 8 and maybe more... Configuration example: Asus R2H: 7 inch (17.8cm) touch-screen LCD, 800 x 480 resolution, Windows XP Tablet OS (Touchpack), 900 MHz Celeron M ULV processor, 802.11b/g, Bluetooth 2.0, 2 USB Ports, 1.3 megapixel front mounted camera, fingerprint reader, GPS receiver, SD Card reader. This term denotes similarity, harmony. When somebody says that something is "compatible", it means it can be used. Compatible with Windows - Programs made for the Windows OS. Programs designed for Linux or other operating systems cannot be used under Windows (however, this can be bypassed by certain SW programs). DOS programs are an exception, as Windows also contains the DOS operating system. However, it does not work the other way - Windows programs cannot be used under DOS. It is recommended that you do not use DOS programs under Windows; while some may cause problems, some work without problems. Compatible with PC (IBM PC compatible / PC Clones ) - First personal computers designed and manufactured from 1981 by IBM began to be called IBM PC/XT and PC/AT. IBM participated in most HW and SW standards used in those PCs. Computers of the same architecture, based on Intel x86 processor (or chips compatible with the x86 architecture - the most popular by AMD) were produced by other companies under their own brands. In order to denote computers of the same architecture, with programs compatible with IBM PCs, they began to be called IBM PC compatible, simply a PC. In case you are buying SW or HW, it must be labeled as PC compatible. Starting in 1987, other companies began to promote their own standards and IBM began to lose its influence on new standards. After 2000, the term IBM PC Compatible was not in common use anymore (IBM PC Compatible = PC). Monitor - Displaying information. You would not see and do anything without a monitor. 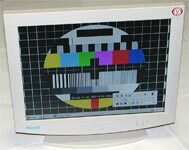 They differ in their screen size and technology - older CRT (Cathode Ray Tube) or newer flat LCD or plasma monitors. 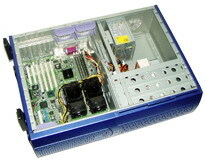 Case - Contains the main computer components. It is sometimes called a system unit. It can differ in appearance which does not determine the features of the computer. Similar looking cases can contain different components which form the computer = a computer set. When buying a new PC, you can choose an already assembled set or you can have it assembled on demand. Theoretically, almost everybody can assemble his/her own computer. In fact, today's computers are like Lego - particular parts can be, with certain limitations, exchanged and the computer upgraded without buying a new one. A ON/OFF switch (sometimes also main switch on the source), Reset switch and diodes indicating the disk operation and computer On/Off status are usually present on the case. Before turning on a computer, you should first turn on the monitor and all the other attached components; the PC itself should be the last one to be turned on. Turning off should follow the reverse course - first the computer and then the other parts. Keyboard - Input peripheral device. It is designed for inserting commands and writing texts. Mouse - Pointing device. It enables to control the cursor on the monitor. User interface - defines the way a user communicates with the operating system or application, and what input and output peripherals can be used and how. There are two types of user interfaces according to controlling and displaying the data: a) Text (using text commands in the Command Line - CLI, or b) Graphic user interface (GUI) using graphical commands. Text user interface (CLI - Command Line Interface) - Text interface for communication between a user and the computer in the operating system or program using text commands. It can seem a bit complicated and confusing. It is mainly used by administrators to access some advanced features or to make certain actions easier and quicker. 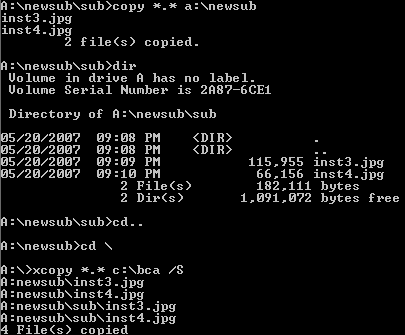 A well-known example of a CLI is the MS DOS operating system or the Command Line in Windows. Graphical User Interface (GUI - Graphical User Interface) - Graphical interface for communication between a user and the computer using graphical elements. The objective of the graphical interface is to provide easy navigation and operation in the operating system. It is controlled by combination of a keyboard and a pointing device (mouse, touchpad, tablet, trackball, touchscreen panel...). Most popular GUI systems are: Microsoft Windows and MAC OS. MS Windows - The most widespread system by Microsoft based on Graphical User Interface and controlled by a pointing device (e.g. mouse) and keyboard. The latest version - Windows Vista - is supposed to replace Windows XP. MAC OS - Operating system by Apple for Macintosh and iMac computers designed by the same company. Until 2006, Apple computers were based on PowerPC architecture processors; in 2006, first computers with Intel processors were introduced - many users have an Apple PC with Windows or MAC OS. Linux - An operating system which can be, upon certain conditions, gained free of charge for private and commercial use. There exist several versions with different features. It is very popular in servers; workstations usually use Windows. Comparing to Windows, Linux has the following main features: 1. Higher complexity for new users, 2. Higher costs for operation and administration. 3. Wide expansion of Windows and Windows-compatible application. 4. Lower number of programs designed for Linux. 5. Insufficient support from Linux manufacturer. Linux supporters and experts often debate what system is better. The biggest advantage of Windows is its wide expansion and support accessibility (many experts and advanced users), literature and available programs. The plus point of Linux is its price, as you may gain the OS, as well as compatible programs, free of charge. According to the type and usage, many users and companies use it as a decent alternative to Windows. My personal experience comes largely from Windows, therefore I will not continue with describing Linux. For detailed comparison, I recommend that you visit websites dedicated to Linux or particular editions. MS DOS (Microsoft Disk Operating System) - An older operating system that is not in frequent use now. In order to control it, you have to know its commands and enter them into the Command Line (text interface). It is a bit more complicated for beginners than the newer operating systems. Today, it is usually used by administrators and advanced users (in an emergency case it can be saved on a floppy disk and started from the floppy disk drive if there are hard disk problems). Some others - E.g. BEOS, Lindows, FreeDOS, QNX and a decent number of others which are in minority and are only used for special purposes.